Spinach pasta is a popular addition to many Italian-style dishes. 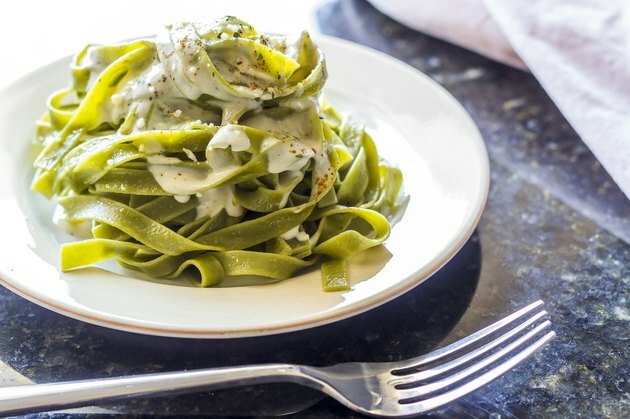 Spinach pasta is low in calories and relatively low in carbohydrates, making it a good alternative to traditional wheat pastas. The standard serving size for spinach pasta is 2 oz., according to the United States Department of Agriculture. Each serving of spinach pasta has 74 calories. One gram of fat has nine calories. Spinach pasta has very little fat. In each 2-oz. serving, it has .5 g of fat, so less than five of its calories are from fat. Each gram of carbohydrates has four calories. Not surprisingly, the more than 14 g of carbohydrates give a serving of spinach pasta the majority of its calories -- accounting for more than 57 of the total calories. A single gram of protein also has four calories. Each serving of spinach pasta has nearly 3 g of protein, so almost 12 calories are from protein. What Are the Benefits of Spinach if You Are Diabetic?